Popping in with a short note to say: “Thank you new World of Darkness fans!” In one day, the Dark Eras Kickstarter for a prestige edition of this book has been fully funded. Now onto the stretch goals! We really appreciate your enthusiasm for the project, and I’m looking forward to what happens next. There’s a lot of great stuff crammed into each chapter for this book already–it’s going to be be-yoo-ti-ful! Announcing the Dark Eras new World of Darkness Kickstarter! Today, I am pleased to announce that my work is featured in a role-playing game supplement for Onyx Path Publishing. The book, which has been put together by senior developer Matt McFarland, is called Dark Eras. The full, unedited text for this book is available on the Kickstarter page. The Dark Eras Kickstarter is for a prestige edition of the book for fans and retailers. Stretch goals will include fan-voted new material; if we get to that point and you like Hunter, don’t forget to vote! 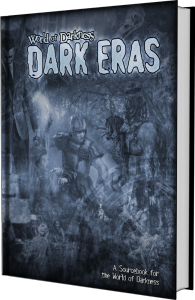 Dark Eras starts out presenting a chapter for each of nine historical eras; one for each of the New World of Darkness game lines. The sections are written for the currently available edition of the game line, but they are designed to be usable with any edition. I was going to dive into a long design essay about the project, but to be perfectly honest I have no idea where to begin talking about our work. The text is fully available so you can read it for yourself and, like always, we took our inspiration from other Hunter supplements, like our expansion of the Scarlet Watch and ties to the Knights of Saint George. So instead, I turn to you. Ask your questions in the comments below, and I’ll do my best to answer them! I was going to talk about Mary Stewart and The Crystal Cave today, but instead I’m going to talk about personas. I’ve been meaning to do this for a while as a follow-up to some posts I’ve offered in the past like this one and this one, but esteemed writer Wesley Chu reminded me of what I’ve been meaning to say. I say all of this with love and my repeated mantra: do what works for you. I don’t care about personas any more. You know, I used to. Being in marketing and business as long as I have, I thought they were important and expected, a much-needed tool to fabricate an image to be memorable. Me? I’d rather be true to myself and worry less about how that’s perceived and received “officially” via a persona. I am a seeker of change and growth, personally and professionally, and I hope that’s reflected in not only what I do, but how, when, and what tools I use to pursue my goals–regardless of the fact that all too often the internet, in particular, never seems to forget a faux pas! I asked myself, when thinking about personas a few years back, what I care about when I interact with fans, peers, and professionals. Being someone I’m not online takes work, because I have to remember who that persona is in real life interactions, meetings, and correspondence. That’s a helluva lot of work to play that role, and that is so anti-everything “Monica” it’s not even funny. Plus, and I ran into this quite a bit, my audiences overlap so much I couldn’t separate out Monica the Persona for TheDayAndNightJobTM versus Monica the Human Being who has friends and loved ones. Instead, what I worry about is being a good person. Yes, sometimes, I worry about this too much. I feel terrible about it, but I had challenges remaining positive going to conventions not knowing anybody because I was intimidated and didn’t understand the differences between PERSONATM I met online and HUMAN BEINGTM in real life. That’s nothing anybody else did; that’s my issue. Anyway, to me being a good person means that I need to be someone other people want to be around, and too often personas, when not done well, can be a disillusionment, a turnoff, an extreme aspect of a personality, a permanently attached soapbox that controls the person inside, etc. I also see through them fairly easily, because of my background. Big name celebrities? Need personas. Not only is it part of their job, it’s a coping mechanism to deal with that many people. However, right now I am not a “big name” celebrity. When and if I ever get to that point, then maybe I’ll reconsider. But for now, I’m a WYSIWIG person. What you see, is what you get. Energy levels, as always, are dependent upon caffeine. Mood: In a state of zen. Wait… Are the cats up to something? Caffeinated Beverages Consumed: More than I care to admit and less than I’d like to believe. It’s Monica because I made it up. It’s Mysterious because you can’t tell what kind of vegetables are in it. (And, I had no idea that it would even turn out.) It’s Magnificent because it takes good. And it’s Meaty Stew…because it’s MEATY STEW! Brown onion and meat with olive oil. Do not drain. Add enough water until it covers the top of your meat and add recommended amount of cubes or soup base. It’s okay if it’s a little strong right now, you’ll add more water in the next pass. Simmer for one hour (stove) or put on low in crock pot (2 hours), then add Tsar Dust seasoning and stir. Add vegetables. Add enough water until top of vegetables is almost covered. (Don’t add anymore because the veggies will cook down.) Simmer for another hour (stove) two hours (crockpot) or until vegetables are tender. Before serving, whisk the brown gravy mix with 1/4 c. of water per packet. Add to mix and turn heat to high. The base will thicken when the mix boils. Serve hot. Mood: I am culinary goddess. Caffeinated Beverages Consumed: Yeah, right. Don’t even think about asking me that. Work-Out Minutes Logged Yesterday: HAH HAH HAH! In My Ears: Lady Crescent Moondragon’s tank. Running Firefly. A Post for GMs. GMs have always been an important part of our design philosophy on the Firefly RPG line, and Margaret in particular wanted to make sure that we had enough support for them. There is a difference between a narrative-based system and a more traditional one with a damage track and XP points. One of the nuances that can be hard for players to wrap their minds around, is that Cortex Plus is player-driven, where the players are in charge and drive the story. How can a GM do this and direct an Episode? When I was designing the Episode structure, I mapped it to the beats of the story presented in the Firefly TV show. (This was a skill I had picked up from the writing, reading, and playing I did for White Wolf. In the Storyteller Adventure System (SAS), there are scenes the GM can run and a number of different paths those scenes can take.) In Firefly, I wanted to give GMs a jumping off point, where we present a possibility of how the story might break down based on what players might do. 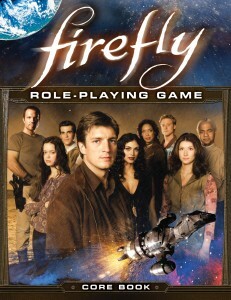 In general, we felt that players would probably be familiar with the feel of a Firefly TV show; the breakdown of the structure is something GMs can use to reinforce Whedon’s powerful characterizations. 1) I shoot at them. A bullet whizzes past your ear. Oh no! What are you going to do now? My reasoning behind this is that firefights can and do happen often in Firefly. When a player is shot at, that often prompts the rest of the Crew to help out. 2) I prompt them. You’re talking to Badger and he’s given you an ultimatum: pay up or hand over one of your Crewmembers. Right now. Don’t know what to do? Have you asked your Captain for advice? Okay, that didn’t pan out. You might want to… And then I give three or four options the Crewmember can cue off of. I’ve never had a player take my exact advice, but uses that as a way to think about what to do next. 3) I use Timed Actions. One of our favorite techniques to influence pacing is to utilized Timed Actions to reflect the pressure in any given situation. The other benefit of Timed Actions, however, is that it prompts teamwork! Each player has a role to take in the Action Order, and they often discuss how to get through that scenario as a team. Works like a charm! 4) I create an Asset/Complication for that Crewmember. Sometimes, Crewmembers need a little help and the best way, I’ve found, is to use the system to do that. A free Asset is something I offer in times of dire need, and it can take the edge off of bad luck. Complications that prompt a character to act, rather than hinder that character, are crucial here. Badly-worded Complications can impact the mood of a game very easily, and it’s a place I’d recommend all GMs either improve upon or collaborate with players. 5) I walk away from the table. I feel that without good synergy at the table, players can get stuck because they’re focused on what they want/need to be doing because they’re worried about the group. When I do this, I plan for a crucial moment. Explain what that moment is, then tell the group: “When I come back, decide on a course of action.” That takes the pressure off that player, and encourages them to work together. 6) I hand out Plot Points. At the beginning of Act I (and so on), I ask players for a recap of the previous scene and hand out Plot Points to the player who summarizes it. I sometimes ask players to recap their favorite moment of the previous act provided they can recommend what someone else did. That, sometimes, adds interesting flavor to the table because a player might not think they’re doing a good job–until someone else says they are. Hope that jumpstarts your brainpan for this particular issue! Happy gaming!